Medical care concepts have advanced in Europe and Northern America, where specialized CF centers provide holistic CF care. The advanced care concepts, developed over the last four decades, have contributed to an increase in life expectancy from only six months in 1959 to around 30 years by 2003. Where optimum CF care is available the predicted median survival is now more than 50 years.9-11 Some of these advances in CF care are yet to be realized in Oman. The current average life expectancy for people with CF in the North Al Batinah region was recently reported as only 10.5 years.12 In addition, there is limited research available on the perceived impact of CF on daily life from the patients perspective, nor is there research on the cultural/ethnic and socio-economic factors that influence attitudes to health and disease with respect to CF care in Oman. The aim of the study was to develop a simple survey that could be used by a nurse during regular CF clinic visits. This survey would have two primary roles, firstly to provide clinicians with a standardized means of longitudinally assessing and monitoring the progressive health status of individual children with CF and secondly, through its regular use and repetition of the survey, provide an opportunity for patient engagement and relationship building. It was also hoped that this individualized and longitudinal approach to symptom progression would enhance patient education and facilitate improved adherence to treatment, thereby improving quality of life for Omani children with CF. A total of 12 children with CF ranging from the age of five months to 15 years (mean age: six years) were assessed using the Cystic Fibrosis Symptom Progression Survey (CF-SPS) during routine outpatient visits to the main hospital serving the North Al Batinah region. Participants who attended less than six times during the study period were excluded from the data analysis. Children under the age of nine were assessed by proxy, usually the mother, and all children were encouraged to share their opinions about their symptoms. Since this survey was being designed to be used regularly with patients, only items that could be reasonably reported by patients (or their proxy) were considered. A preliminary thematic content analysis of the items identified in the literature review revealed 10 items that were frequently associated with PEx, and therefore symptom progression, in CF. These included seven respiratory-related items: cough frequency, condition of child during coughing, description of child’s coughing episodes, amount of sputum, colour of sputum, effort of breathing, and short/shallow/fast breathing and three generic items: level of activity, usual appetite, and recent changes in appetite. Responses to each item were in the form of either a visual analogue scale or a Likert scale. The survey score was then transformed linearly to a 100-point scale, with higher scores indicating higher symptom severity, revealing a significant decline in health status, and thus an increased likelihood of a PEx. Where appropriate pictures were added to maximize face validity and make it user-friendly particularly for the younger participants. The survey was translated into Arabic by a native speaker with a postgraduate level of English, using the iterative forward-backward translation sequence.35 All of the data presented here was completed using the Arabic version of the CF-SPS. The CF-SPS was administered using a nurse-led individualized and informal interview style approach. This took the form of a two to five minute discussion with the patient or their proxy. In many instances the survey items were read aloud to the parent by the nurse, as some of the parents did not have educational ability to read through the items clearly. The temporal focus of the CF-SPS is to report symptoms within the previous one week. Table 1: Glossary of psychometric terms. A multivariate statistical technique that, essentially, reduces a correlation matrix into a few major pieces. It describes which variables “go together” and aims to extract principal components to condense as much of the total variation in the data as possible with a minimum number of components. In factor analysis this describes the correlation between one of the variables and the factor. It selectivity differentiates individuals with a high occurrence of the construct from persons with a low occurrence of that construct. A statistical test that determines whether the distribution of a variable is different from the normal distribution. A measure of the consistency of a test scale; it examines whether all items of a scale measure the same construct. A descriptive statistic that is used to detect outliers in a dataset. Analysis of the psychometric properties of the CF-SPS included face validity (determination of whether the questions are clearly worded and understood by patients). Internal scale consistency was also assessed using Cronbach’s alpha coefficient and confirmatory factor analysis, using a principle component analysis with varimax rotation, to determine scale component properties. For the reliability and factorial analysis, each survey completion was considered as an independent sample. While it is statistically desirable for the psychometric analysis involved in survey development to be based on a large sample of individuals there are often constraints imposed by contextual and clinical factors. For example, the sample used here constitutes all patients with CF who make use of the local regional hospital. In addition, tests of variability, such as the Kolmonogorov-Smirnov test, and tests of collinearity (see Table 1 for glossary of psychometric terms) was conducted to ensure that the non-independent data did not unduly influence the reliability analysis and interpretation. The CF-SPS was completed for every occasion that a child with CF visited the clinic. Symptoms among CF sufferers vary according to a wide range of factors including, disease severity, age, general health status, and adherence. Therefore, it is important to use an individualized approach to patient monitoring. In order to facilitate this, a baseline was determined for each patient on the basis of the mean of the patient’s four lowest CF-SPS scores during the study. In order to derive a range for the normal variation in symptom severity, the five patients with the most stable CF-SPS scores over a six-month period were selected. The normal variation range was defined as twice the standard deviation (SD) of the scores from these five stable patients. None of these patients experienced a PEx during this period. This range equated to a 10-point variation in the CF-SPS score. An individual’s normal variation during a period of stable symptom expression was therefore defined as 10 points above and below their baseline. This will be referred to as the green zone. Therefore, survey scores that occurred within the green zone were considered to be acceptable and not indicative of new intervention. The area above the green zone will be referred to as the red zone, within which, scores were considered significant declines in health status. A score in the red zone will be referred to as a spike. Table 2: Construct and reliability analysis of the ten items included in the survey. The CF-SPS has good internal consistency with a Cronbach’s alpha coefficient (C-alpha) of 0.76. In addition, all items are independently worthy of inclusion in the CF-SPS. The greatest increase in C-alpha would result from removing the item on “usual appetite”, but this would lead to a rise of only 0.002 in internal consistency, therefore all 10 items were maintained. As with most clinical data most of the items in this survey are non-parametric and displayed significant skew. This is to be expected since the desirable distribution for clinical datasets is usually a skewed sample in favor of a healthy status. Multivariate, non-parametric outlier analysis showed that this data did not include any significant outliers with Mahalanobis distance showing no items with a probability less than 0.001 (for the 10 items). In addition, factor analysis suggests that it is reasonable to consider the CF-SPS as a single construct. Principle component factor analysis indicated that the item loadings for all 10 questions were greater than 0.30 for the first component of the construct [Table 2]. An analysis of missing cases showed that for two items there was a significant increase in missing data. These two items both involved sputum symptoms. Some participants were not habitually expectorating sputum, but would rather swallow it. For this reason several participants did not complete these two items: color and amount of sputum. This preference for non-expectoration of sputum has been previously noted in the literature.38,39 The internal consistency of a partial CF-SPS with these two items removed was nearly identical to the full scale indicator of reliability (C-alpha=0.75). Since these two items seem to contribute to the same single factor construct as the other eight items it was decided that for patients who could not answer these questions the remaining eight items would be transformed linearly to a 100-point scale, to allow for comparison to be made. Figure 1: Cystic fibrosis health diagrams showing the Cystic Fibrosis Symptom Progression Survey (CF-SPS) score of three patients during the study period. The green (base) zone for each individual is shown. (a) Patient showed a stable pattern and favorable health status with no admissions or suspected acute pulmonary exacerbations (PEx). (b) The patient was stable but showed a suspected spike. The patient was not admitted for PEx. In contrast (c) shows a patient who exhibits an erratic pattern and unfavorable health status with two spikes (scores in the red zone) corresponding with admissions for PEx. Analysis of CF-SPSs obtained during clinic visits allowed us for the first time to plot and track the longitudinal course of pulmonary function, as shown in Figure 1. Two distinct patterns emerged, a consistent pattern characteristic of a stable health status and an erratic pattern representing an unstable health status. 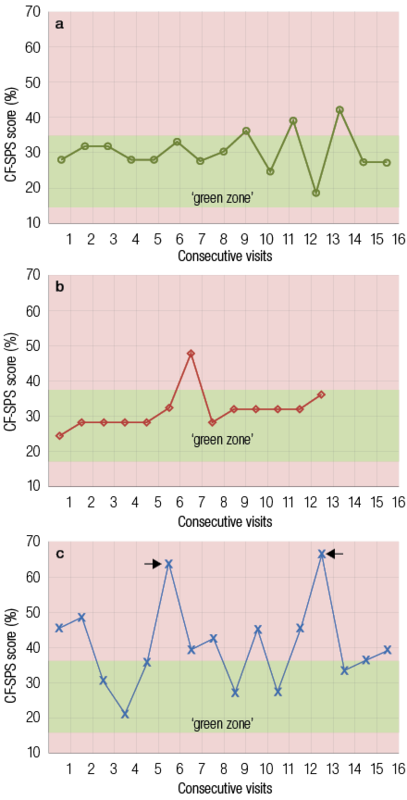 A CF patient with a controlled and stable health status will have a longitudinal CF-SPS profile that falls largely within the green zone, as seen in Figure 1a. In contrast, Figure 1c showed a longitudinal CF-SPS profile from an unstable patient, with an erratic fluctuating pattern, defined by frequently occurring spikes in the red zone. These red zone spikes are the result of an increase in symptom severity and represent periods of worsening health status. Interestingly, the spikes often coincide with clinician-diagnosed PEx experienced by the patient, represented by the arrows in Figure 1c. The CF-SPS that were associated with admission were significantly higher compared to those not associated with admission (t(1,132)=6.3, p<0.001) with mean scores of 52.7 and 34.4, respectively. Thus a higher CF-SPS score is a useful indicator of likelihood for hospital admission and PEx. Chi-square analysis shows that this frequency data [Figure 2] is significantly different from that expected from a null hypothesis (Χ2=25.7, p<0.001). Specifically, red zone spikes are associated with hospital admission. 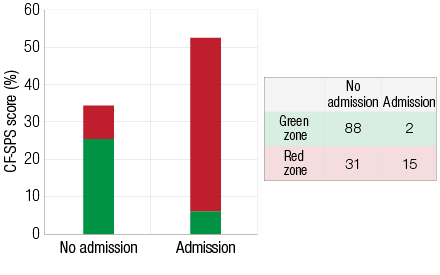 We observed that 88 green zone surveys were coupled with no admission and only two admissions associated with green zone surveys. Of the 46 red zone spikes 15 were associated with admission for PEx while, surprisingly, no admissions occurred in 31 of the visits in which a spike was identified. Eleven out of the 12 participants experienced at least one red zone spike in CF-SPS during the study period. Figure 2: Mean Cystic Fibrosis Symptom Progression Survey (CF-SPS) scores for hospital admissions. The colors on the figure represent the total proportions of the CF-SPS that were in the green or red zones. The admissions frequency table is shown to the left. A similar significant relationship was established between the CF-SPS score and chest sound scores when analyzed by Pearson’s correlation (R2=0.45, p<0.001). In addition, using a t-test to test the difference in chest sound scores between green zone and red zone CF-SPS score, showed that there were significantly worse chest sounds for survey scores in the red zone (t(1,112)=5.65, p<0.001) with a mean chest sound score of 4.10 for surveys in the red zone and 0.90 for surveys in the green zone. Using Pearson’s correlation we observed a significant negative correlation between CF-SPS score and BMI (R2=-0.42, p<0.001). Figure 3 illustrates that a low BMI percentile is associated with a higher CF-SPS score as highlighted by the solid trend line. It appears that those patients with lower BMI percentiles are more susceptible to respiratory symptoms including PEx. However, no significant correlation was found between BMI percentiles and admissions. So while CF-SPS is predictive of an admission, a low BMI was not predictive of admission for PEx. Admissions compared to non-admissions appear to be associated with significantly higher CF-SPS scores illustrated by the higher dashed trend line. Figure 3: A scatter graph showing the relationship between body mass index (BMI) percentiles and Cystic Fibrosis Symptom Progression Survey (CF-SPS) scores. Crosses indicate non-admissions with the solid line displaying the corresponding trend line. Red diamonds indicate an admission, with the trend line for admissions shown by the broken line. The CF-SPS performs well as a psychometrically valid clinical tool. In addition to patient satisfaction as a measure of face validity, it also shows good internal scale consistency and reliability. Thus we recommend the CF-SPSa (Arabic version) as a valid tool for the longitudinal monitoring of symptom progression in CF in Arabic speaking populations. Systematic and longitudinal use of the CF-SPS for each patient can provide valuable individual and cohort information that may not have been identified previously. These individual health profiles are a valuable addition to the clinician during clinic visits. Participants who exhibit an erratic or unfavorable health pattern in their CF-SPS scores can be identified as “at risk” and perhaps requiring further investigation to identify contributing factors such as non-compliance, lack of knowledge, or nutritional deficiencies. Conversely, the treatment regime for a patient who exhibits a consistently low CF-SPS score with a stable pattern could be considered as adequate and low risk. Our study also confirms a strong link, which is well documented, between nutritional status and lung health.4,6,31,32 We found that a low BMI was associated with a higher CF-SPS score. On average our participants had a BMI well below the recommended 50th percentile. One important characteristic of the cohort in this study was the frequent number of PEx, with seven out of 12 participants admitted at least once for IV antibiotics. It appears that those with poor nutritional status are more susceptible to acute respiratory exacerbations. With further significant declines in BMI common during periods of PEx (due to increased metabolic requirements), and the subsequent decline in lung function. This could, in part, explain the low survival rate seen in our patients.26,27,33 We propose that the most favorable picture for a child with CF is a low CF-SPS score (within an individual’s green zone), with a higher BMI percentile. In contrast, a child with a low BMI and CF-SPS scores frequently in the red zone reveals an unfavorable health status. We observed that there were 46 CF-SPS scores that fell within the red zone (spikes) during the study period. However, 31 of these did not result in admission for IV antibiotics. There could be many reasons for this outcome, for example, the green zone may underestimate the range of healthy states and therefore small spikes are frequently identified when the child is doing well and does not need additional hospital-based treatment. The CF-SPS relies on the honesty of the participant or proxy and therefore it may be possible that the information provided was biased to avoid admission. We have observed several occasions when an admission for the treatment of a PEx has been strongly recommended by the clinician but refused by the patient and/or family. It is worth noting that in Oman no home care is available so all IV treatment requires a lengthy hospital stay, which can be very disruptive for families. As this study represents the longitudinal findings for only 12 patients, the extent to which they can be generalized to other patient groups is limited. While it may be statistically desirable for there to have been a larger sample size, clinical factors constrained this and these 12 patients constituted all of patients with CF available who make use of the local regional hospital. We would welcome the use of this survey in other clinical centers to enhance the generalizability of these findings. Cultural, social, educational, and economic factors undoubtedly play a major role in CF care in Oman, influencing attitudes towards illness and treatment compliance, and in turn may affect the number of admissions, type of treatment children receive, and ultimately, the outcome. For example, according to the World Health Organization world health statistics 2013, literacy in Oman is around 87% among adults aged 15 or over.40 However, the 13% who remain illiterate are thought to be living in rural/mountainous regions such as in the north Al Batinah region of Oman, in which this study was conducted. Socioeconomic status is known to have a major influence on outcomes in CF, with more frequent PEx and significantly lower BMI and lung function being associated with lower incomes.41,42 This may in part explain the poor health status observed among some of the participants. The authors declared no conflicts of interest. This research was funded by a grant from The Oman Research Council (TRC Grant #ORG OMC HSS 10 008). Mehta G, Macek M Jr, Mehta A; European Registry Working Group. Cystic fibrosis across Europe: EuroCareCF analysis of demographic data from 35 countries. J Cyst Fibros 2010 Dec;9(Suppl 2):S5-S21. Seliger VI, Rodman D, Van Goor F, Schmelz A, Mueller P. The predictive potential of the sweat chloride test in cystic fibrosis patients with the G551D mutation. J Cyst Fibros 2013 Dec;12(6):706-713. Zemanick ET, Harris JK, Conway S, Konstan MW, Marshall B, Quittner AL, et al. Measuring and improving respiratory outcomes in cystic fibrosis lung disease: opportunities and challenges to therapy. J Cyst Fibros 2010 Jan;9(1):1-16. Leonard A, Davis E, Rosenstein BJ, Zeitlin PL, Paranjape SM, Peeler D, et al. Description of a standardized nutrition classification plan and its relation to nutritional outcomes in children with cystic fibrosis. J Pediatr Psychol 2010 Jan-Feb;35(1):6-13. Konstan MW, Butler SM, Wohl ME, Stoddard M, Matousek R, Wagener JS, et al; Investigators and Coordinators of the Epidemiologic Study of Cystic Fibrosis. Growth and nutritional indexes in early life predict pulmonary function in cystic fibrosis. J Pediatr 2003 Jun;142(6):624-630. Peterson ML, Jacobs DR Jr, Milla CE. Longitudinal changes in growth parameters are correlated with changes in pulmonary function in children with cystic fibrosis. Pediatrics 2003 Sep;112(3 Pt 1):588-592. Elborn JS, Bell SC. Pulmonary exacerbations in cystic fibrosis and bronchiectasis. Thorax 2007 Apr;62(4):288-290. Matel JL, Milla CE. Nutrition in cystic fibrosis. Semin Respir Crit Care Med 2009 Oct;30(5):579-586. Dodge JA, Lewis PA, Stanton M, Wilsher J. Cystic fibrosis mortality and survival in the UK: 1947-2003. Eur Respir J 2007 Mar;29(3):522-526. Döring G, Flume P, Heijerman H, Elborn JS; Consensus Study Group. Treatment of lung infection in patients with cystic fibrosis: current and future strategies. J Cyst Fibros 2012 Dec;11(6):461-479. Chakrabarty B, Kabra SK, Gulati S, Toteja GS, Lodha R, Kabra M, et al. Peripheral neuropathy in cystic fibrosis: a prevalence study. J Cyst Fibros 2013 Dec;12(6):754-760. Fass U, Al Oraimi M, Thomas R, Dhouwayani S, Al Naqbi M, Al Balushi N, et al. Survival analysis of cystic fibrosis (CF) patients in the North Al Bathina region of the Sultanate of Oman. Journal of Cystic Fibrosis 2010;1(9)S112:432. Britto MT, Kotagal UR, Hornung RW, Atherton HD, Tsevat J, Wilmott RW. Impact of recent pulmonary exacerbations on quality of life in patients with cystic fibrosis. Chest 2002 Jan;121(1):64-72. Liou TG, Adler FR, Fitzsimmons SC, Cahill BC, Hibbs JR, Marshall BC. Predictive 5-year survivorship model of cystic fibrosis. Am J Epidemiol 2001 Feb;153(4):345-352. Goss CH, Burns JL. Exacerbations in cystic fibrosis. 1: Epidemiology and pathogenesis. Thorax 2007 Apr;62(4):360-367. Dakin C, Henry RL, Field P, Morton J. Defining an exacerbation of pulmonary disease in cystic fibrosis. Pediatr Pulmonol 2001 Jun;31(6):436-442. Bilton D, Canny G, Conway S, Dumcius S, Hjelte L, Proesmans M, et al. Pulmonary exacerbation: towards a definition for use in clinical trials. Report from the EuroCareCF Working Group on outcome parameters in clinical trials. J Cyst Fibros 2011 Jun;10(Suppl 2):S79-S81. Goss CH, Edwards TC, Ramsey BW, Aitken ML, Patrick DL. Patient-reported respiratory symptoms in cystic fibrosis. J Cyst Fibros 2009 Jul;8(4):245-252. Abbott J, Hart A, Morton AM, Dey P, Conway SP, Webb AK. Can health-related quality of life predict survival in adults with cystic fibrosis? Am J Respir Crit Care Med 2009 Jan;179(1):54-58. Abbott J, Holt A, Morton AM, Hart A, Milne G, Wolfe SP, et al. Patient indicators of a pulmonary exacerbation: preliminary reports from school aged children map onto those of adults. J Cyst Fibros 2012 May;11(3):180-186. Rothman ML, Beltran P, Cappelleri JC, Lipscomb J, Teschendorf B; Mayo/FDA Patient-Reported Outcomes Consensus Meeting Group. Patient-reported outcomes: conceptual issues. Value Health 2007 Nov-Dec;10(Suppl 2):S66-S75. Quittner AL, Alpern AN, Kimberg CI. Integrating patient-reported outcomes into research and clinical practice. In Wilmott et al. Disorders of the Respiratory Tract in Children. 8th Edition. Oxford, 2012. p.251-60. Oermann CM, Retsch-Bogart GZ, Quittner AL, Gibson RL, McCoy KS, Montgomery AB, et al. An 18-month study of the safety and efficacy of repeated courses of inhaled aztreonam lysine in cystic fibrosis. Pediatr Pulmonol 2010 Nov;45(11):1121-1134. Jarad NA, Sequeiros IM. A novel respiratory symptom scoring system for CF pulmonary exacerbations. QJM 2012 Feb;105(2):137-143. Sawyer SM, Aroni RA. Sticky issue of adherence. J Paediatr Child Health 2003;39(1):2-5. Ferkol T, Rosenfeld M, Milla CE. Cystic fibrosis pulmonary exacerbations. J Pediatr 2006 Feb;148(2):259-264. Rabin HR, Butler SM, Wohl ME, Geller DE, Colin AA, Schidlow DV, et al; Epidemiologic Study of Cystic Fibrosis. Pulmonary exacerbations in cystic fibrosis. Pediatr Pulmonol 2004 May;37(5):400-406. Rosenfeld M, Emerson J, Williams-Warren J, Pepe M, Smith A, Montgomery AB, et al. Defining a pulmonary exacerbation in cystic fibrosis. J Pediatr 2001 Sep;139(3):359-365. Turner RR, Quittner AL, Parasuraman BM, Kallich JD, Cleeland CS; Mayo/FDA Patient-Reported Outcomes Consensus Meeting Group. Patient-reported outcomes: instrument development and selection issues. Value Health 2007 Nov-Dec;10(Suppl 2):S86-S93. Quittner AL, Modi AC, Wainwright C, Otto K, Kirihara J, Montgomery AB. Determination of the minimal clinically important difference scores for the Cystic Fibrosis Questionnaire-Revised respiratory symptom scale in two populations of patients with cystic fibrosis and chronic Pseudomonas aeruginosa airway infection. Chest 2009 Jun;135(6):1610-1618. Steinkamp G, Wiedemann B. Relationship between nutritional status and lung function in cystic fibrosis: cross sectional and longitudinal analyses from the German CF quality assurance (CFQA) project. Thorax 2002 Jul;57(7):596-601. Borowitz D, Baker RD, Stallings V. Consensus report on nutrition for pediatric patients with cystic fibrosis. J Pediatr Gastroenterol Nutr 2002 Sep;35(3):246-259. Naon H, Hack S, Shelton MT, Gotthoffer RC, Gozal D. Resting energy expenditure. Evolution during antibiotic treatment for pulmonary exacerbation in cystic fibrosis. Chest 1993 Jun;103(6):1819-1825. Henry B, Aussage P, Grosskopf C, Goehrs JM. Development of the Cystic Fibrosis Questionnaire (CFQ) for assessing quality of life in pediatric and adult patients. Qual Life Res 2003 Feb;12(1):63-76. Beaton DE, Bombardier C, Guillemin F, Ferraz MB. Guidelines for the process of cross-cultural adaptation of self-report measures. Spine (Phila Pa 1976) 2000 Dec;25(24):3186-3191. World Health Organization. Child growth standards. Geneva, 2006. Available at http://www.who.int/childgrowth/en/. Accessed June 24, 2013. Fass UW, Al-Salmani M, Bendahhou S, Shivalingam G, Norrish C, Hebal K, et al. Defining a mutational panel and predicting the prevalence of cystic fibrosis in oman. Sultan Qaboos Univ Med J 2014 Aug;14(3):e323-e329. de Jongste JC, Shields MD. Cough. 2: Chronic cough in children. Thorax 2003 Nov;58(11):998-1003. Tierney S, Riley D, Jones AM, Webb AK, Horne M. Differing perspectives of sputum and its expectoration: a qualitative study involving patients with cystic fibrosis and physiotherapists. Physiother Theory Pract 2011 May;27(4):278-286. World Health Organization. World health statistics 2013. Geneva, 2013. Schechter MS, Shelton BJ, Margolis PA, Fitzsimmons SC. The association of socioeconomic status with outcomes in cystic fibrosis patients in the United States. Am J Respir Crit Care Med 2001 May;163(6):1331-1337. Quittner AL, Schechter MS, Rasouliyan L, Haselkorn T, Pasta DJ, Wagener JS. Impact of socioeconomic status, race, and ethnicity on quality of life in patients with cystic fibrosis in the United States. Chest 2010 Mar;137(3):642-650. McCullough C, Price J. Caring for a child with cystic fibrosis: the children’s nurse’s role. Br J Nurs 2011 Feb;20(3):164-167. Lipson JG, Meleis AI. Issues in health care of Middle Eastern patients. West J Med 1983 Dec;139(6):854-861. Al-Wahaibi A, Almahrezi A. An application of educational theories and principles of teaching and learning communication skills for general practitioners in oman. Oman Med J 2009 Apr;24(2):119-127. Jimmy B, Jose J. Patient medication adherence: measures in daily practice. Oman Med J 2011 May;26(3):155-159. Norrish MI. Learning about Challenges to Medical Professionalism in Oman: A Culturally Contextualized Approach? Oman Med J 2012;27(2):182. Al-Kindy H, Ouhtit A, Al-Salmi Q, Al-Bimani M, Al-Nabhani M, Gupta I. Novel Mutation in the CFTR Gene of Cystic Fibrosis Patients in Oman. Journal of Molecular Biomarker and Diagnosis 2014;5(168):2-5.